Happy Monday!! Lollipop Crafts starts a new challenge today and both teams are playing along. The theme this week is ANYTHING GOES!! It was my cousin's one year old daughter's birthday party this past weekend, and I made this card using Balloon Lucy from CC Designs. Colored her up in Copics, added Stickles and Clear Stardust glitter pen for her pretty dress. Found a great sketch at The Sweet Stop, flipped it up to fit this sweet image. Papers are from BG Kioshi pad... almost all gone. sniff! sniff! :( But couldn't resist using the pretty purple and green combo. Used Spellbinders Nestabilites round die-cuts for the sentiment, CC Design Cutters for the butterfly, and EK Success border punch. Studio G sentiments, ribbon and gem from Michael's. Stop by the LC blog for more awesome creations made by the girls. Hope you can find some free time to play along with us. such a sweet card!! love the layout too! Gorgeous card, Mimi. I love this colour combo. Sweet pixie and beautifully coloured. Thanks for coming over to play with us at Sweet Stamping Pixies. 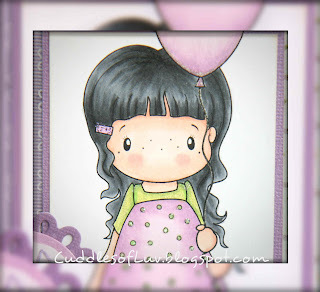 What a darling image for a little girl and so wonderfully colored! 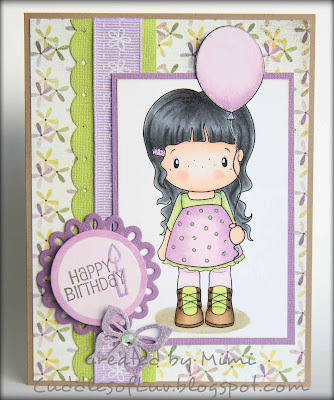 Love how the balloon pops out of the box and the soft feminine colors! Thanks so much for joining us at The Sweet Stop this week, Mimi! What a sweet card Mimi. Love the darling image, the colors... the butterfly and circle/flower shape greeting look great! Thank you for playing along with us at The Sweet Stop this week! Such a pretty card... I LOVE the colours... and the colouring of the image is just fantastic! Thanks for joining us at SSP challenge! So adorable! Love all the purple! Cute Balloon Lucy card Mimi! Love how you colored her and designed with the sketch! Darling card! So glad you linked up to the Sweet Stamping Pixies Challenges! Thanks for playing! your card is pretty! Thanks for joining the SSP challenge.